Pork is the culinary name given to the meat from the domestic pig or hogs of about 6 to 7 months old. It is eaten in many countries and is one of the most commonly eaten meats in the world. Most of this meat is cured and made into ham, bacon and sausage. Fresh pork is the uncured meat. Pork can also be processed into different forms, which often increases its shelf life, such as cured, smoked or a combination of these. It can also be made into ham, bacon and sausages. Domesticated pigs are regarded as ‘dirty’ in the Jewish and Muslim religions because they will feed off household refuse. However, commercially produced pigs are fed on better diets and as a result they produce tender meat with exceptional taste. 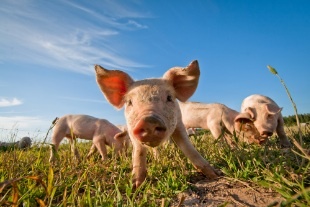 Pork attains its highest quality when the livestock is slowly matured, grazing freely in good pasture. Due to improved breeding, feeding and animal welfare, there is much less fat in pork today, making it an excellent choice for health conscious individuals. The best cuts of pork should have firm flesh that is greyish pink in colour with no trace of moisture, or hair. Look for cuts with a relatively small amount of fat over the outside. For real juicy flavour and tenderness, the meat should have small streaks of fat within the muscle. This is known as marbling. Beware excessive marbling which will not increase the quality. Pork with little marbling may be dry and lacking in flavour. The meat should be pale pink, not red or dark red which would normally suggest an older animal. For more information on pork go to our pork cuts page. Click the links to find out 'how to cook roast pork with crackling and 'how to slow roast belly pork, slow roast pork shoulder and other joints'.